The founder and proprietress of Cosmic Academy is Jayaliila. Jayaliila is a native of Ghana and is from the Ewe tribe of the Volta Region. Ewe is her native language, she also speaks fluent English. She is a teacher by career, and has taught at numerous schools within Ghana. 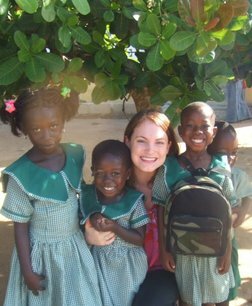 With her experiences in teaching, her dream begin to grow to one day have her own school. Almost 12 years ago, thanks to the help of one volunteer who shared this vision and incredibly managed to raise $20,000 this became a reality. Zoe is our volunteer coordinator. Zoe is based in the UK and has remained involved in the project since volunteering at the project in 2007. Zoe is the first point of contact for prospective volunteers and is happy to answer any questions via email or Skype. Should you confirm your wish to join our project, Zoe will assist you with making travel plans and will guide you in preparation for your trip! ​ Cosmic Academy is situated in a quiet and peaceful neighbourhood, but the busy road leading to Ghana's capital is just a short stroll away. Accra is approximately one hour away by vehicle. The children attending Cosmic Academy come from the surrounding neighbourhoods and belong to different tribes, speak different mother tongues, and practice different religions. Children range in age from two to fourteen years-old, and their developmental levels are as different as their personalities. There are also children with Special Educational Needs who are enrolled in the school. These children require additional support as they explore the learning process. 120 children are enrolled at present, but enrollment fluctuates. The children have high energy levels and are rambunctious. They like to play and run about. They also love to learn and to show you all that they know. The class sizes are large and there are a shortage of trained, experienced teachers. This is why Cosmic Academy depends on volunteers to assist the class teachers to enable our children to reach their full potential.